How to make pasta in the summer interesting, spicy, unusual? Easily! Do not think that this is a long and tricky, you only need to cut the pumpkin into pieces and send in the oven. The rest will take a few minutes. 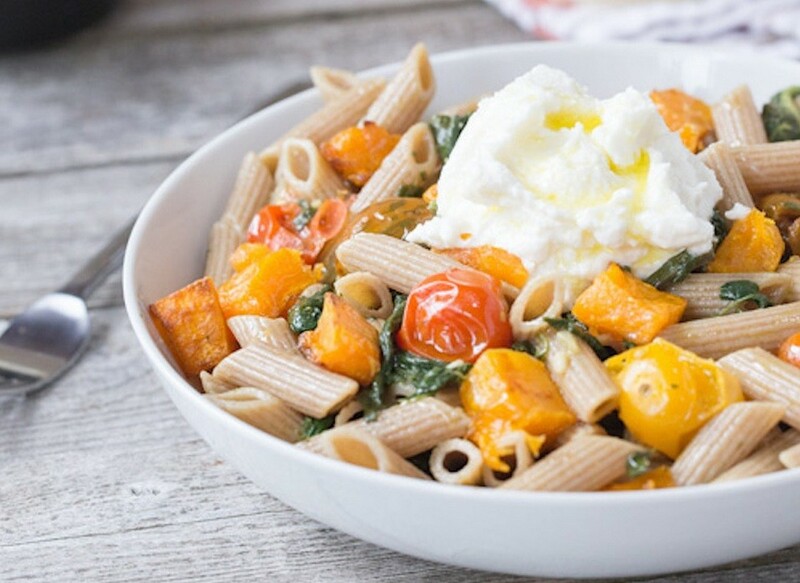 Spicy pumpkin wonderfully complements the taste of whole wheat pasta. Spices - thyme, nutmeg and cinnamon - here, too, play an important role. Adding them or not - it is certainly a matter of taste, but they paste turns into a crazy mix of bright, "cream" and spicy! *You can use frozen (4-6 cubes), previously thawed. First you need to cut the pumpkin into small cubes and brushing pieces of coconut or olive oil and sprinkle with spices, spread on a baking sheet (preferably with parchment) and bake in oven at 180 30-40 degrees minutes. Shortly before the willingness of pumpkin (minutes per 10-15), send it to cut in half cherry tomatoes. They also have to bake, but the time it takes quite a bit. Once browned pumpkin and tomatoes "podvyalilis" can be turned off. Put the pan on the stove, slightly greased. And the water in the saucepan for pasta. Garlic squash, and after a bit of chop and send it to the pan, there too - spinach leaves (they can be not much smaller, by heat treatment, they decrease in volume). Turn down the fire and stir constantly. When the water to boil in a saucepan, pour the pasta, salt, and cook according to the instructions (but it is better to taste to pasta were "Al dente"And not seethe until tender). Ready discard the pasta in a colander, then send it to the frying pan to the spinach (with fire by this time off!). There also send the pumpkin and cherry. Little Mix spatula (do not zealous). Serve the spicy paste with roasted pumpkin and spinach, sprinkled with parmesan or decorate a soft blue cheese - these varieties ideally set off the flavor of the ingredients. If you want a softer creamy taste - decorate the finished dish ricotta, vzbryznuv a little olive oil. Well, now you know exactly how to make pasta an unusual and refined as in the restaurant! P.S. Любите итальянскую кухню? Тогда порадуйте себя и любимых классическим рецептом risotto with shrimp and spinach.